I adore rayon! It’s the fabric I most wish would come back into modern fashion. I’m always on the hunt for rayon with a great retro style print and I fell in love with this divine polka dot yardage. It’s the size of the print and the color that make this perfect for late 30s/early 40s rather than 50s/60s where polka dots often shine. I ended up pairing this with Wearing History’s Dahlia blouse pattern. Originally, I had a button down blouse in mind but once I got this fabric in my hands, I knew it was screaming to be something more drapey. The version I made has a cute little bow in the back! 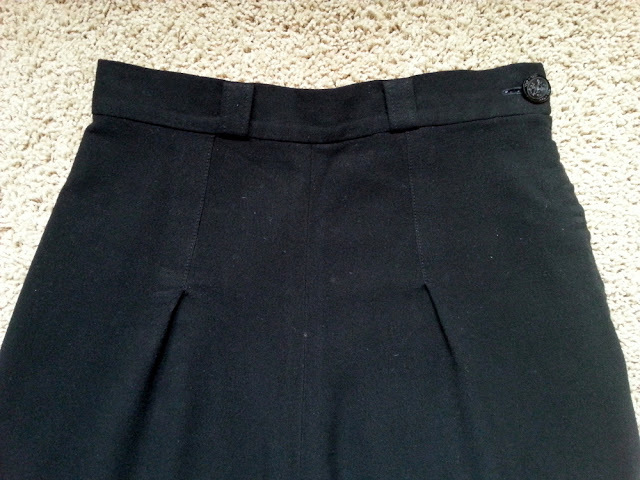 And the back is longer to help it stay tucked in to skirts and pants. 1900s and 1910s blouses often have this feature and I have to say it’s quite handy. I also love, love the neckline! It’s high but not too high. And the edge of the wrap is cut on the grain rather than the bias like most wrap dress/blouse patterns I’ve worked with so there’s no bias stretch to make your neckline gape open. To finish off the look, I also whipped up Simplicity 3457, an early 40s 12 gore skirt, in some fine whale corduroy. For a more in depth pattern review of the Wearing History Dahlia blouse pattern and more photos, feel free to pop on over to my blog. I love separates! But pretty dresses often distract me…… Today I’ve been good and worn two new me-made separates. The blouse is Butterick 7641 c. 1958. And the shorts are Wearing History’s WWII Overalls pattern. I love the little tab details on this blouse! They give it a bit of a western feel. And I’m so loving these shorts this summer! It’s hard for me to find shorts that fit well since I’m so curvy. Even repro companies often are not curvy enough. I’m so happy that I finally conquered my fear of denim because it’s really not that bad! More photos and construction details over on the blog. 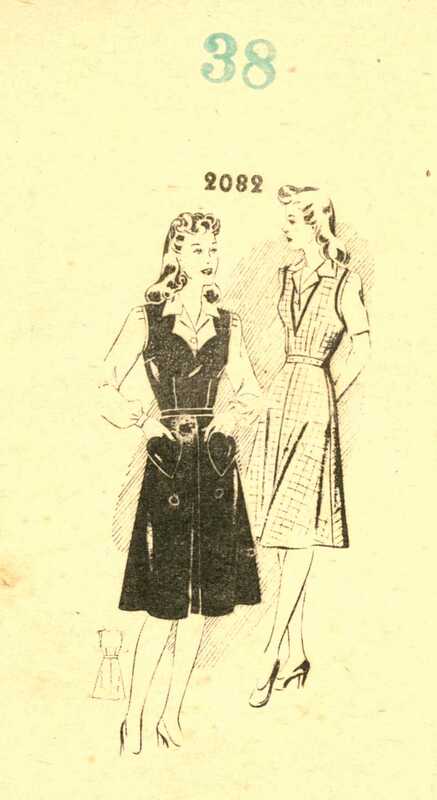 I’m still plowing on with my attempt to have a completely wearable 1940s wardrobe – either by buying or making the outfits I want need. And the latest gap to be filled – a 1940’s jumper dress! The pattern is Mail Order 2082, and I (hesitantly) used the sweetheart neckline version, with heart patch pockets. I was a bit unsure about the almost ‘twee’ detailing – I like feminine clothes but this is really femme! Heart pockets? I think using navy gaberdine, a tough tailored fabric with this girlish pattern was a good match and the style is balanced in the middle. Surprisingly, the pattern fitted really well with minimal adjustments. Normally I’ll have to fiddle with the armhole depth, waist height, dart placement – but not this time. Minimal amount of mods, listed on my blog. The blouse is Smooth Sailing from Wearing History (my favourite shirt pattern), made from deco-print quilters cotton with vintage celluloid buttons. One more photo because I’m so happy with how this has turned out! Sewing pants can be tricky but with the price of repro jeans being sky high, I knew I had to give making my own a chance! This was my first time sewing with denim and it went really well! My machine needed a bit of persuasion to get it to sew pretty buttons in denim but I prevailed. I made these from Wearing History’s 1940s WWII overall pattern. It was really great to work with! I chose a medium weight 7oz denim so I could wear them all year round. I’m really pleased with how these came out! I’m pretty sure I never need to buy repro 40s jeans again! I’ve got a much longer review and many more photos over on the blog! Have you ever made 40s pants or overalls before?